Hello. The weather outside might be frightful but it's time to start thinking about some amazing opportunities for history teachers this upcoming summer. During the school year things get so hectic that it is often hard to really dive into an indepth study of the your curriculum content. The summer offers some great opportunities to learn from experts, visit historical sites and meet other teachers. Over the past couple of weeks I've been reseaching some opportunities for workshops and seminars available to history teachers. Check out the links in the show notes and apply for a few yourself. I plan on applying for at least one. Podcast #54 - What Would Lewis and Clark Text Message to Thomas Jefferson? Hello. Last week we studied one of my favorite topics in the curriculum - the Corps of Discovery. I think this is such an amazing story with so many different angles from which to approach it - heroic, adventure, risk, etc. We have done various activities over the years to bring it alive to students. Around 4 years ago I was awarded a grant through the Friends of the Missouri Archives Lewis and Clark Bicentennial Commission to purchase the clothing that would have been worn by a member of hte Corps of Discovery. I did my research on the clothing of the era - the most complete resource I found was the book Lewis & Clark: Tailor Made, Trail Worn--Army Life, Clothing, & Weapons of the Corps of Discovery . I then worked with the James Country Mercantile - a local business here in Liberty that outfits Civil War reenacters and other historical time periods. I typically come to school one day a year in the entire outfit. Some years I have even put red coloring in my hair and portray William Clark. A couple of years ago I came to school in the outfit and then sat through 4 hours of parent teacher conferences dressed as a member of Corps of Discovery - the scary part is some of the parents did not even ask me about it and most have assumed that was the way I usually dress! More details about the outfit in the podcast. There are numerous videos available on the Corps of Discovery which work well in the classroom. Some of the videos I have used in the past include: BIOGRAPHY: Lewis & Clark: Explorers Of The New Frontier from A&E and The Techology of Lewis and Clark by the History Channel. The video I am currently using to show my students is Great Journey West - Lewis and Clark by National Geographic - orginially created as an IMAX film this 45 minute video has some of the most beautiful and authentic footage of the trail. If you do show your class the video don't forget to show them the bonus material on the DVD that includes a "how they made the video" segment which is also top notch. This year I also thought I would mix in a little of modern reality to the study of the expedition and I asked my students to imagine that one of the members of the Corps of Discovery was using a cell phone to text message Thomas Jefferson about an event along the journey - the first sighting of the Pacific, the discovery of the source of the Missouri River, etc. I gave them a copy of an IM glossary that I took off the Internet - I did some editing of course. They had to use 10 "IM terms" in the exchange. The students thought it was great. As several educational bloggers have stated in the past - we shouldn't be upset that our students use IM as a way to communicate, we should be impressed that they have created a useful and practical language to quickly communicate with each other. The outrage from stunned teachers around the country over Discovery Education's shocking decision to fire their field managers and others in the education division continues. Former Georgia DEN members Jeff Giddens and Daniel Rivera maintain the SEGA Tech and have posted a detailed description of their anger over the firings. Click here to go directly to the DEN post on the SEGA Tech site from December 8th. The Art Guy at the Academic Aesthetic Blog has also been posting his personal comments on the situation with this post from December 7th. Oklahoma DEN member Michael King has created a video to honor the DEN Field Managers on their amazing work over the past 18 months. View the video here. The South Valley Jr High 9th grade broadcasting class featured a story on the recent DEN activity here in Liberty called "Tech or Treat" which was sponsored by Discovery and had over 60 area teacher attend. Check out their story here (the entire broadcast is good but if you want the DEN story it starts at around the 11:00 mark.) This was really what I thought DEN was about and it would not have been possible without the help our field manager Linda Chiles. Thanks Linda - at least we know that we put on one heck of a workshop and helped area teachers learn more about technology. This will be may last post about the DEN situation. I'm still really upset at the decision made and don't think I can support a company that has done this to their loyal employees. I will be curious to see what the remaining DEN members decide to do as a plan for action - they are great people and they are left with an almost impossible task. There are too many great things still happening in education today and I need to start putting my energy there. I feel drained from a weekend of trying to make sense of it all. Hello. This whole Discovery Education Network thing just makes me more upset as more time passes. I really thought a couple of days would help but it hasn't. I know some of the people who remain at DEN and I know they are good people who want the best for educators but the corporate side of Discovery has basically insulted all DEN members by assuming we will continue to basically work for them for FREE and promote their products to fellow teachers. I still don't know if I want to remain an active part of DEN or cut all ties but things like the following article about the elimination of the Field Managers really makes me mad. "Company officials said many of the positions were unnecessary and that the changes would not impede the company's goal of expanding its education business, which it says reaches 70,000 schools." "We announced a reorganization of the education group this week. That included shifting responsibilities, elimination of office space and reduction in force that included redundancies and overlapping functions," said David Leavy, a Discovery spokesman." "According to an internal memo sent to employees Wednesday, the division's revenue has grown 350 percent since 2004. The company declined to give the division's total revenue amount. It also said affected staff might move to other openings within Discovery, including to new initiatives planned for 2007." "Whenever a company completes multiple acquisitions, there is an important responsibility to continually re-evaluate existing costs, structure and business strategies," Steve Sidel, executive vice president in charge of Discovery Education, said in the memo. "Discovery Education is now in a position to consolidate the business operations of these new companies and gain valuable economies of scale through a careful elimination of redundancies and certain non-core functions." Are you kidding me? They called the Field Manager postion "unneccesary" and it would not "impede the company's goal of expanding it's education BUSINESS". If BUSINESS is all they are concerned about you think a 350% increase in revenue might be enough for them. I think the writing is on the wall - what I thought made Discovery great (the personal aspect and the person connection) is now out the and bottom line is what it is all about. I truly worry about the good Discovery DEN people left because it looks like corporate is planning on trying to have you do the work of the 20 people that they fired and if they think I'm going to use a web based portal in the same manner I used the Field Managers they have played the wrong card. There are plenty of other organizations and causes that I can spend my time and energy on to help students and teachers. 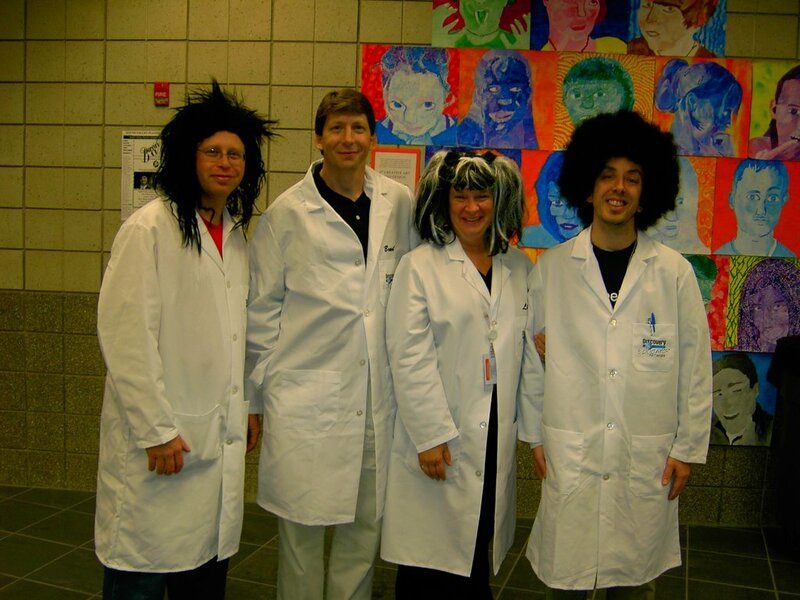 I'm sending back my Discovery Educator lab coat to Discovery on Monday. I feel bad for the seven DEN people left but unless something BIG happens to reverse this injustice I'm not longer proud to be a member of DEN - an organization that I once promoted everywhere I went. Sad. Hello. I'll let today's podcast speak for itself but let's just say that today Discovery Education made a huge mistake in letting their Field Managers go. What a loss. 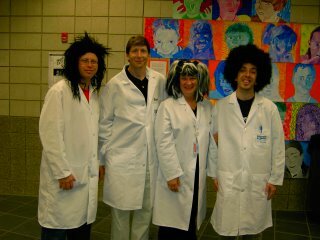 The Discovery Educator Network had been a huge success in the educational world but that changed today. Things will not be the same without the face to face contact with our field manager. It's not about the product - it's about the people. Corporate America 1, Teachers and Students 0. Linda - we'll miss you here in Liberty, please stay a part of our family. You are awesome! Please note that these comments are my personal feelings and are in no way prompted by Linda Chiles or any Discovery Education representative. Hello. This past week while attending the NCSS conference in Washington DC I was able to slip away during a lunch break to visit one of my favorite locations in our nation's capital - Ford's Theatre. 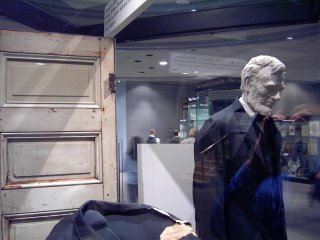 As a child a loved to read books about Lincoln and was aways amazed by the assassination of Lincoln at Ford's Theatre. I can remember reading a book about presidents and aways coming back to the story of Lincoln. It has always held a special place in memory. 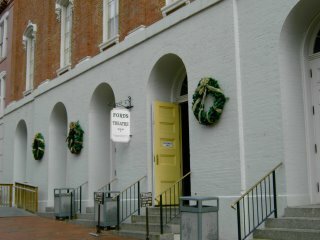 During my recent visit I was able to interview Gloria Swift - curator of the Ford's Theatre Museum. The basement of the theatre has a great museum and bookstore. It is incredible to see the door that Booth drilled a hole through to be able to look in the President's box. 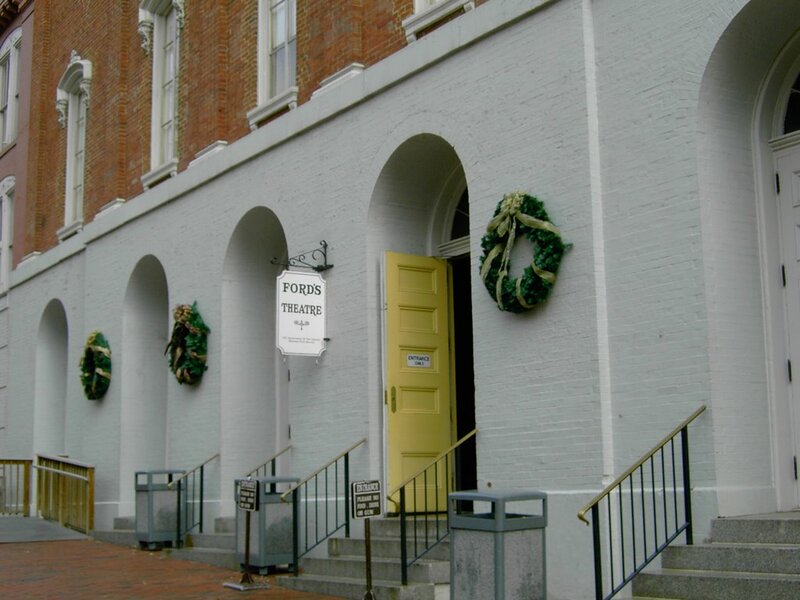 Be sure to also walk across the street after your tour of the museum and check out the Petersen House - the place Lincoln died after being shot in the theatre. At the Petersen House I was able to interview Michael Robinson who plays the role of a local law official that was present on the night Lincoln died. Thanks to Gloria and Michael for allowing me to interview them for the podcast. Hello. Here is another gem from the exhibit floor of the 2006 NCSS conference in Washington, DC. 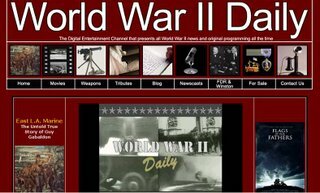 If you teach World War II in your American history curriculum you need to check out the new World War II Daily site. I interviewed Steve Rubin, creator of the World War II Daily site at his booth on the floor of the exhibit hall. 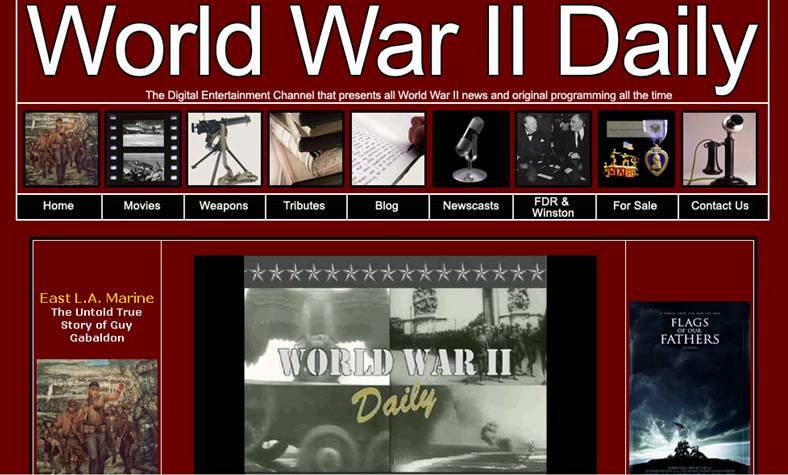 The concept is great - a daily updated news program covering six years of World War II. I really like the idea of allowing students to see the news of the day as it happened rather than using the perspective of hindsight. The site also includes features covering movies, weapons, a blog, newscasts, FDR & Winston and items for sale. 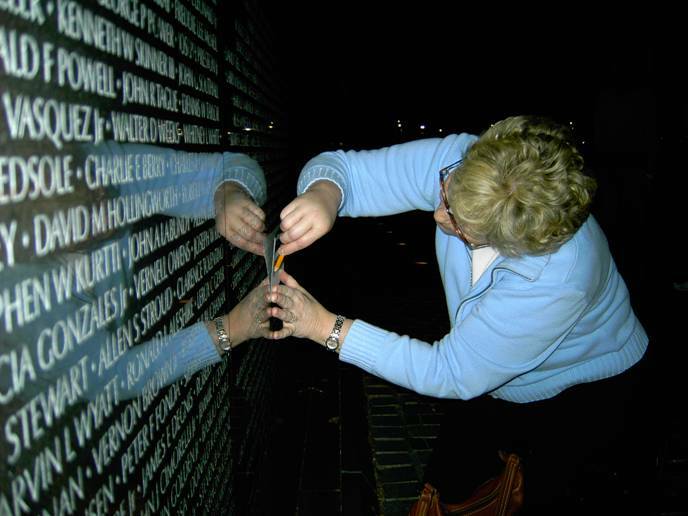 My favorite feature is the tribute page in where you can honor a veteran from your family. Check out the page. 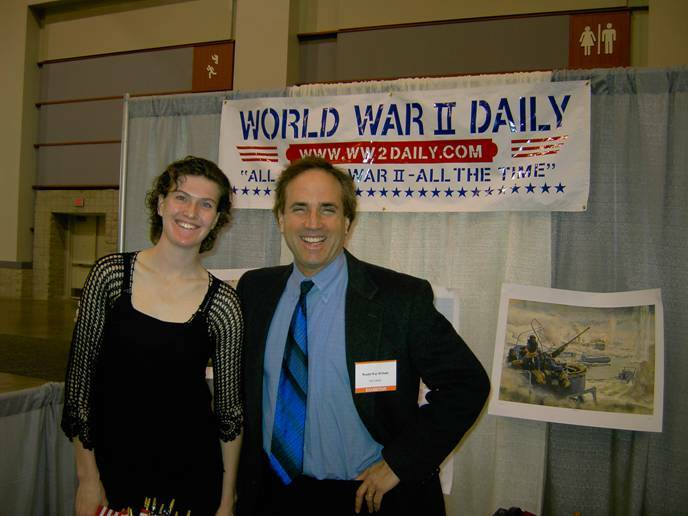 As it develops I think it will become a great resource for teachers and students studying World War II. Hello. 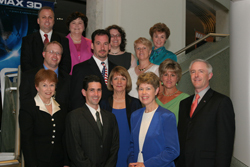 Just a reminder that the nominations for the 2007 Cable's Leaders in Learning Awards are due in about a week and a half from today - December 15th, 2006. If you know someone that is leader in using cable technology in education please check out the application and send it in today. I was very honored to earn an award last year in the Pushing the Envelope category and it was an incredible experience that I will never forget - it was truly like being a rock star in our nation's capital - meeting Brian Lamb of C-Span, touring the C-Span facility, a private movie screening, meeting senators and representatives, meeting great people in education from across the country and a very special awards ceremony that last year was at the Smithsonian. Check it out today and send in an application. Greatings from the 2006 National Council for the Social Studies conference in Washington DC. Like I did last year at the national convention in Kansas City, I roamed the exhibit looking for hidden gems - items that really help history teachers. 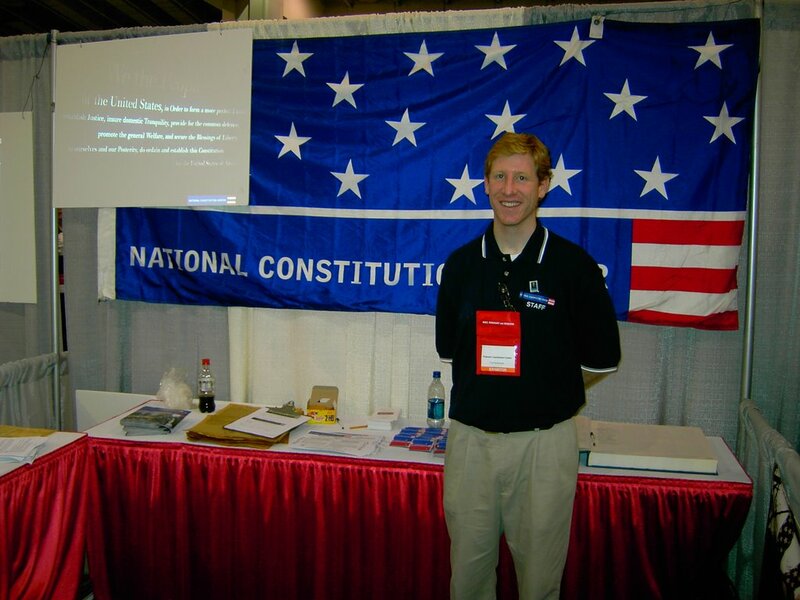 I found several and tonight I want to share one of them with you - the National Constitution Center in Philadelphia and some exciting opportunities for teachers coming up in the summer of 2007. I stoppedy by the National Constitutional Center booth in the exhibit hall and visited with Carl Ackerman - a teacher at the new Constitution High School in Philadelphia. The podcast includes this interview. The Constitutional Center has some incredible opportunities for teachers this summer to study and learn about American History in Philadelphia. Check out the links for more information in the show notes. The official site is also very impressive - interactive games for students, links to primary documents, timelines, lesson plans and ideas for Constitutional Day and short audio files entitled "Constitutional Minutes". Hello from Washington DC- the site of the 2006 NCSS conference. We got in last night after a crazy day of travel. The Kansas City area has been hit hard over the past couple of days with ice and snow. Our school district did not have school on Thursday due to ice and winter conditions but we were able to fly out of KC in the early afternoon due to a break in the weather. We left Kansas City's ice and snow to great weather in DC. We checked in to the hotel and then walked around the city, went to see the monuments on the Mall and enjoyed the 70 degree weather. Back home in KC they also called off school for today - Friday. The Liberty Public School group here at NCSS is very happy that we made it and that we can enjoy the conference. 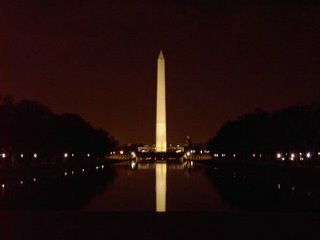 Last night we visited the monuments at night. 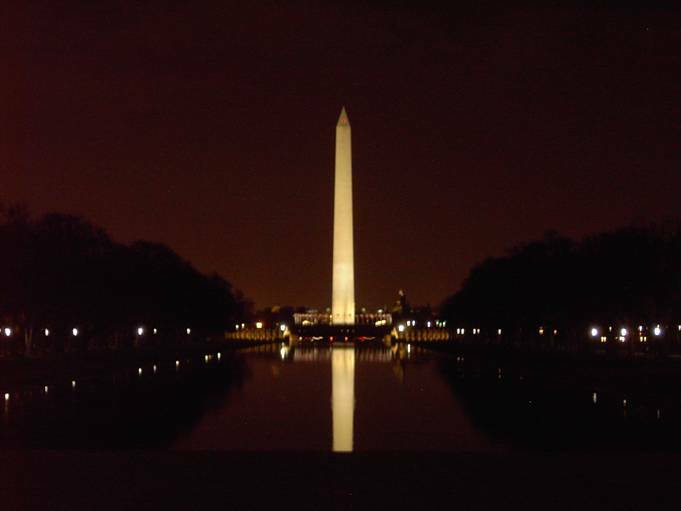 I love the Lincoln Memorial the most and I think it is most impressive at night. 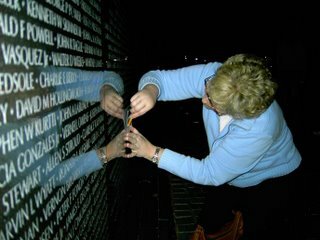 We have one teacher from Liberty in our group that has a family member on The Wall so she made a rubbing of the name to take back home. That was my most memorable momment from last night. We are getting ready to head over to the convention center for a day of visiting the exhibition hall and listening to presentions. I will try to take pictures and audio and hope to have something to add later tonight.